The Work Crews screen displays a list of crews and employees who are members of each crew. 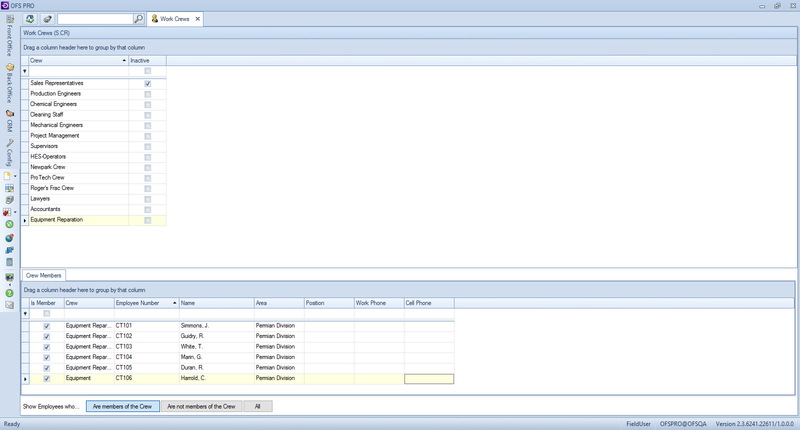 On this screen, you can create, edit, and delete work crews; you can also add and remove employees from each crew. Create a new crew by pressing Ctrl+N or right-clicking in the grid and selecting New from the menu. Give your crew a name, then click the “OK” button to save. View which employees are currently in your crews on the “Crew Members” tab. You can add any existing employee to the crew by clicking either the “Are not members of the Crew” or “All” buttons on the bottom of the screen, then clicking the checkbox in the “Is Member” column to the left of their name. Employees can be assigned to only one crew at a time.